1. A is the sister of B. B is married to D. B and D have a daughter G. How G is related to A? 2. Radha is Kunal’s sister. Mamta is Kunal’s mother. 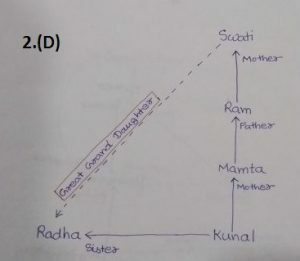 Ram is Mamta’s father. 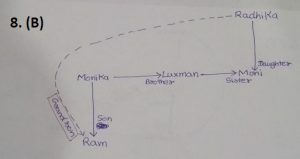 Swati is Ram’s mother. 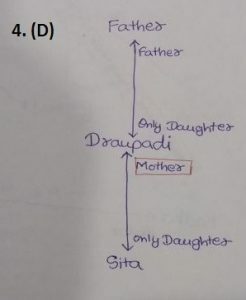 How is Radha related to Swati? 3. 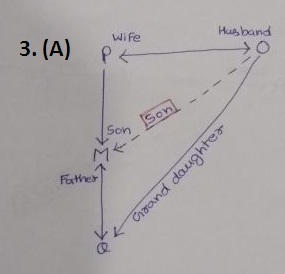 M is the son of P. Q is the granddaughter of O, who is the husband of P. How is M related to O? 4. Introducing Sita, Draupadi said, “ She is the only daughter of my father’s only daughter.” How is Draupadi related to Sita? 5. 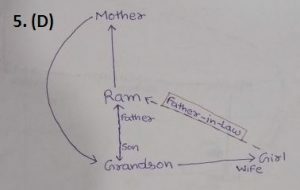 Ram said, “This girl is the wife of the grandson of my mother.” How is Ram related to that girl? 6. Pointing towards a boy Luxmy Said “He is the son of the only son of my grandfather.” How is that boy related to Luxmy? 7. A and B are a married couple. X and Y are brothers. X is the brother of A. How is Y related to B? 8. Ram is the son of Monika. Luxman is the brother of Monika. Moni is the daughter of Radhika. Moni is the sister of Luxman. How is Ram related to Radhika? 9. X and Y are brothers. 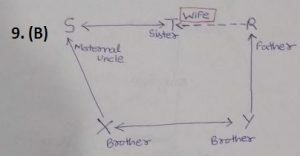 R is the father of Y. T is the sister of S, who is maternal uncle of X. How is T related to R? 10. P and Q are sisters. R and S are brothers. 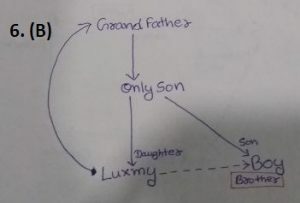 P’s daughter is R’s sister. What is Q’s relation to S?